Turn-of-the-century Portland hip hop in the heezy. My brother will have to refresh my memory as to how we got into this group. I seem to remember seeing them live and thinking they were pretty sweet, but I can't for the life of me remember what show they would have been the opener for. Now I'm doubting the fact that I ever saw them. That doesn't really matter. What does matter is that these dudes were some up-and-comers in the Portland hip hop scene when that label barely existed, so we thought they were pretty cool. I still do. This CD has some sweet cuts on it. I think my brother had both of their CDs (I believe Posanegavybe was the other one, and it came out the year before this one), but this is the only one I ever ended up with, and I don't think I even bought it until maybe five years ago. And talk about discs I haven't played in a long time. I forgot I even had this thing. And while some of it's coming back to me now, there's really only a few songs that stand out, and among those, one in particular: "Master of Ceremonies," a song that we used to rock repeatedly in car rides, because it is supremely awesome. Of course I can't find a full version of it online. Bleh. I always got the vibe that these guys weren't too far out of high school when they released this, so it's no surprise that they didn't stay together for a long time. But good local hip hop was tough to come by back then, so we were happy to have discovered these dudes. I'm going to have to go back and get to know this one again. I was actually handed a flyer for "Posangavybe" in Portland in '98 and was fascinated by the idea that there was a "rap scene" in Portland that wasn't Cool Nutz. Then we did in fact see them open for The Gza the first time we saw them because I remember being curious to see what the dudes from the flyer were like (yeah, I kept it for a long time to remind me of their name so I could try to find their album, pre-internet style). They were the opener, then Oldominion, then Gza. What a show. Shortly after that show I found "Posanegavybe" in Wherehouse's dollar bin. Lucky me because that album is bonkers. I still rock it on a pretty regular basis. 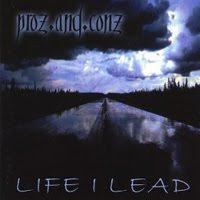 "Life I Lead" I found later in the same fashion and, although a great album, pales in comparison to the first one. Some dudes had changed and "Life I Lead" seems to suffer at the time from the crew trying to make a stereotypical rap album. The production is a bit cleaner but yet not as catchy. Some of the subject matter slips into cliched territory with guns and weed jams. Also, I knew it was a bad sign when they printed the lyrics to each chorus in the booklet. What is that about? All of my nit-picking aside, I still really love this album and am proud that it comes from our small hip-hop town of Portland. Someone should have just told Oddyseus and LOS that they can't rhyme. Stand back amateurs and let KCP, DVS, Gemini and Nemesis do their thing.